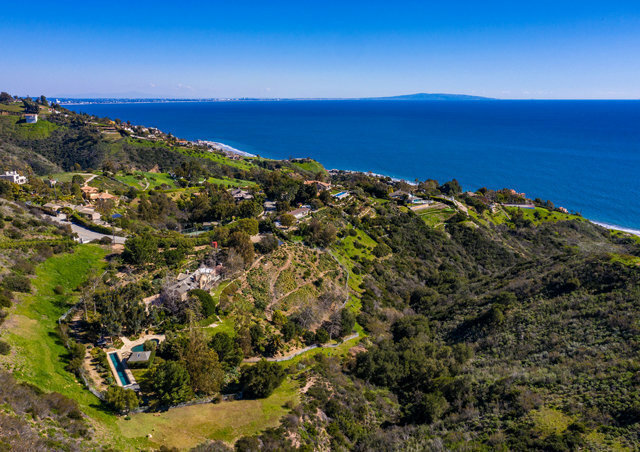 One of the most private ocean and mountain-view estates in central Malibu, this magnificent property is sited on over five park-like acres. A long, gated driveway and motor court lead to the five-bedroom main house with a dramatic two-story living room that opens to majestic grounds. Located off an exceptional chef's kitchen, a voluminous family room overlooks mesmerizing ocean views, lined with French doors that foster a harmonious flow to romantic al fresco entertaining spaces, including a fireplace and bbq area. The master suite wing features dual walk-in closets and a private, enclosed balcony, all with beautiful ocean views. Landscaped grounds and pathways join the main residence with a gym/pool house, grassy lawns and two ocean-view pools, including a regulation lap pool. Complete with a detached guest house, three-car garage and La Costa Beach Club and Tennis rights, this serene residence is just moments to the world-renowned beaches, shops and restaurants of Malibu.